Okay so I figured out how to upload again. User error. But now my problem is figuring out the Jebao controlling. It should be the 5th port on my expansion hub. it isn't even on? Where do I plug the Dimming cable on the Jebao cable? Last edited by lion-clown on Sat Apr 19, 2014 11:14 pm, edited 1 time in total. Oh and I'm not able to connect to the app on my phone. 1st when you copy your code, just do a regular copy, don't use the copy for forum or coy as HTML from the Arduino, it adds in all sorts of other stuff that's not actually part of your code like the color tags. 2nd about the phone App. Does the portal work? What type of phone do you have? It seems like you may not have port forwarding setup on your router or you need a DNS service like no-ip to update your IP address to a DNS name that you setup and have the portal and phone look at. Without it every time your IPS changes your IP address you will lose connectivity to the RA. The Dimming cable on the Jabeo goes to one of the dimming ports on the Relay or the Dimming module (not the dimming ports on the expansion relay, they don't work). It looks like you only have 1 Jabeo, correct? The Jebao pump does not need to be in port on the relay. Those wavemaker port (5 & 6) are only for regular powerheads. They have dampening circuitry to soften the startup of the power head. Okay so I changed that and the pump works now but I'm not getting the wave I use to have. Is it even possible to do? So the portal is working but it says this: Connection Status:	Unreachable Address. Also how do I get the portal to show up at the bottom of my post? 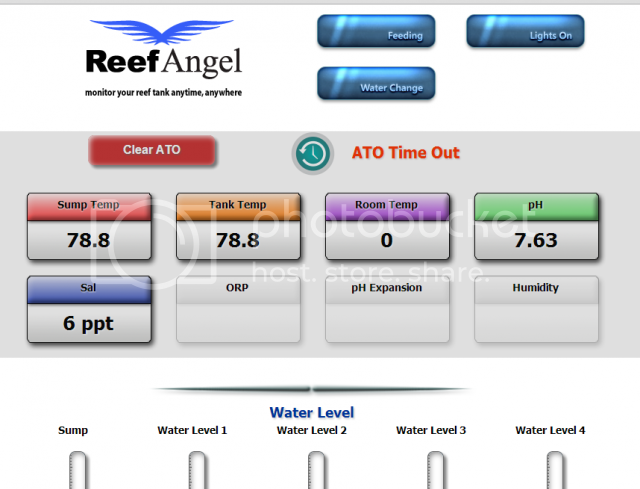 What do you set your heater to on the Reef Angel? And what do you set your temperature to on the actual Heater? Thanks so much for all the help. I know what you mean about just leaching off of everyone because that is all I have done so far but the people on here are so amazing and helpful. See i would be getting frustrated, but you think it's fun. Good for you. You have a Jebao 25 in a 40 gallon breeder tank, correct. That would make it 36" long. You may want to increase the pump speed from 50 to 70%, try keeping it at a 10% variable +/-. If the portal is saying Connection Status:	Unreachable Address, then something is still not set up properly. Did you setup port forwarding for port 2000 in your router and did you set up a DNS server so wen you IP address changes it will pick it up and continue working? Also have to set your router to assign a static IP address to the RA? You don't want that to change every time you reboot the RA or router. Try typing in the internal IP address of the RA followed by :2000/wifi. For example mine is http://192.168.1.199:2000/wifi. When I do it I get the internal server. If that works go to http://www.yougetsignal.com/tools/open-ports/ and check to see if port 2000 is open. If it is make sure you have a DNS service setup. Once you are getting information in your portal you can set up the banner in you signature by going to "Web Banner" in the portal, choosing the version that you like and copying and pasting the code for that banner into your signature for the forum in the User Control Panel. Setting up the heater you got, me I don't use a heater in South Florida, but I would say to set the RA for the temp that you want it to go on and off at and then set the heater a little lower than that so when the RA kicks power to the heater the heater will already be in the on range. If you are still having problems with the portal PM me and maybe we can set up some kind of remote session via TeamViewer or Gotomy PC so I can get into your system with you and check things out. Yes I have the WP 25 and a 40 gallon breader tank and it is 36 in. I will try the 70% next. I guess it is a little frustrating but I kind of like tinkering with the tank constantly and this gives me an outlet to work on without messing up the tank. "Did you setup port forwarding for port 2000 in your router and did you set up a DNS server so wen you IP address changes it will pick it up and continue working? You don't want that to change every time you reboot the RA or router." But I hope to have some time tomorrow to play with it. I leach when it comes to coding, but I try to make up for it in answering basic questions that Roberto and you don't have time for.